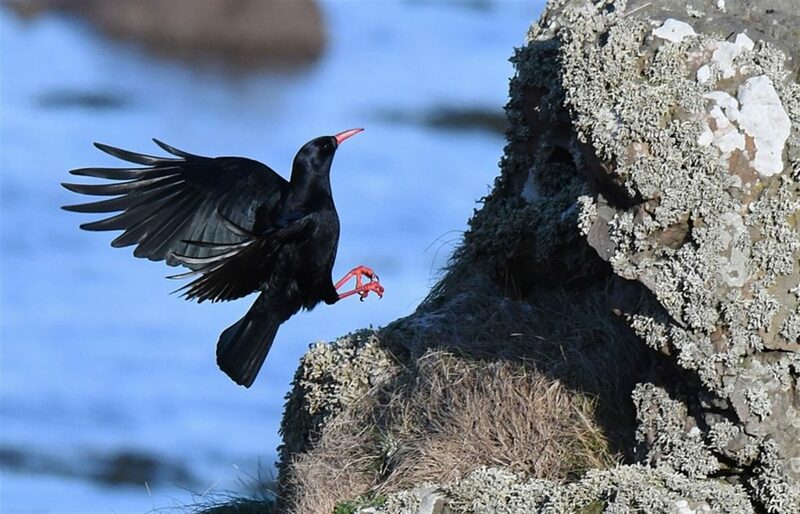 The discovery of a Chough just North of Turnberry lighthouse on January 30th 2019 came almost 90 years after the last totally reliable record of the bird in Ayrshire. A once widespread bird in Scotland, the numbers today have declined to the point where it hangs on in places such as Islay, Jura and Colonsay, with all of the former Scottish mainland haunts now unoccupied by breeding pairs. In South-west Scotland, it would appear that the writing was on the wall from around the middle of the 19th century, when significant declines were noted by the ornithologists of the day. One comment made at the time stated that it had been abundant on all the rocky headlands of Scotland in 1835 but “had vanished nearly everywhere by 1865.” Choughs weren’t restricted to coastal Scotland as is exemplified by records of birds from inland localities such as Assynt, Glen Lyon, Glen Clova and the Ochils. These inland locations had, however, mostly been abandoned by the early 19th century. Within Wigtownshire, nesting pairs were still recorded from locations like Port Logan and the Mull of Galloway until 1919, with an estimate of 7 pairs claimed for the former site. The fate of the Ayrshire coastal birds mirrored that of their Wigtown cousins, since the bird was obviously showing a sharp decline in numbers by the middle of the 1800s. Gray comments that it had still been present at Culzean until at least 1850, but Charles Berry of Lendalfoot paints a gloomier picture. In 1908, he stated that he had seen nesting birds not far from Lendalfoot just a few years before, but that it was fast disappearing. Gib Graham wrote that the bird had once been “very common” on Knockdolian Hill in the mid 19th century and placed the blame for its decline on the Jackdaw. The 1920s still provided a few Ayrshire records but usually of just one or two birds. Sadly, by 1929, Richmond Paton reported that “one, occasionally two pairs of Chough continue to breed in Ayrshire” – this was at a site which they, wisely, did not name, perhaps providing a clue as to one of the contributory factors in the bird’s disappearance. So, just why did the Chough disappear from Ayrshire, and much of the rest of Scotland? Like most cases of extinction, the causes may be unclear and much-debated, and it’s often difficult to identify the main culprit. However, some factors do stand out as candidates leading to the Chough’s downfall. The Jackdaw was seen as a potential competitor by many ornithologists in the 19th century. Graham clearly points the finger at it. However, it seems unlikely to have been solely to blame. For whatever reasons, game-keepers were said to have accounted for some birds, while the gun most definitely did remove birds from areas of the Rhinns of Galloway where Choughs were said by local farmers to be responsible for damage to their crops and “stooks.” It may be that the fashion for bird “collection” and egg-collecting, prevalent in the mid 1800s simply added the final nail in its coffin in areas where the bird’s numbers had dwindled seriously. By the end of the 20th century though, Choughs still clung on in areas where the nature of both landscape and land use still afforded them a living: much of Wales, the Isle of Man, North and West Ireland. They are largely sedentary which raises the obvious question of where the Turnberry bird came from. It seems unlikely that Choughs will make a comeback any time soon in the South-west of Scotland, given the pressures they face, and the current Turnberry specimen provides us with yet another clear example of a beautiful bird which, like Corncrake and Corn Bunting in Ayrshire, can disappear all too suddenly from our lives. This entry was posted in Articles on 19-Feb-2019 . 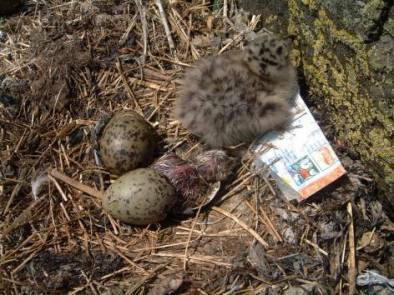 Colour Ringed Gulls Need You! 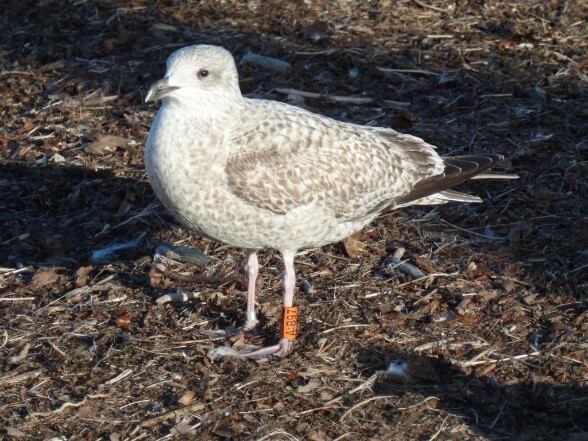 This report on the 2013-2014 Lady Isle gull colour ringing project first appeared in the Ayrshire Bird Report 2014 and is published with permission from Ayrshire SOC. This entry was posted in Articles, News on 22-Feb-2018 . 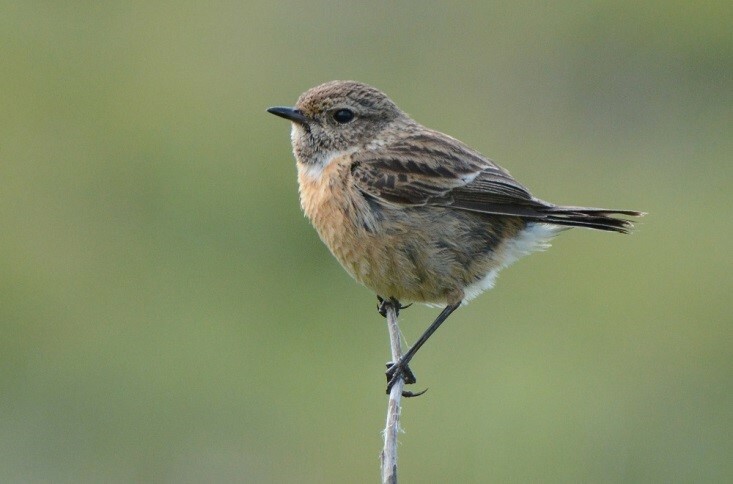 A survey in 2013 of most of coastal Ayrshire’s Stonechat breeding population was undertaken, mostly by volunteers from the SOC or RSPB, following the devastating effects of the 2010 and 2011 winters. With a run of milder winters from 2013 onwards, it was hoped that there might be some improvement, although the rate of recovery was unknown at that time. Many observers continued to send records in on an annual basis, and it became possible to identify the rate at which some coastal territories were being reclaimed by this species. Fifteen stretches of coastline in particular were visited, when possible, during the breeding season and the number of pairs holding territory within each was recorded. Casual records for areas outwith those mentioned in Table 1, were also recorded, to give a rough idea of the overall rate of recovery in the county. Although, in many cases, observers noted breeding outcomes, this article concentrates only on territorial occupation and those territories occupied by breeding pairs. In some cases, notes were also made on habitat alteration, particularly that which might have affected the presence of Stonechats. 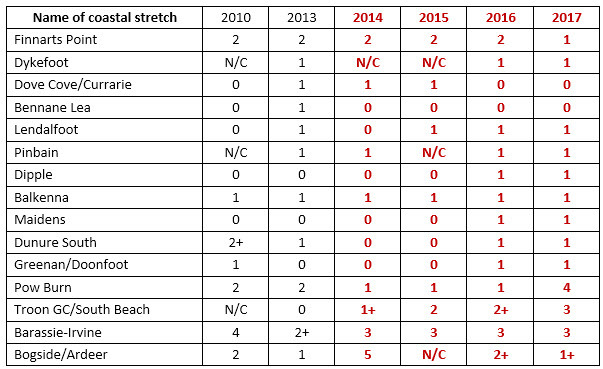 A small band of observers, to whom I am very grateful, continued to provide information on coastal stretches southwards from Ardeer from 2014 to 2017, and a total of 15 such sites were covered regularly enough to enable the provision of data on the number of territories occupied in each (Table 1). The area of each of these stretches varies greatly, and it would be wrong to assume that all were visited with the sole intention of obtaining Stonechat breeding information. In many cases, observers were involved with other survey work at the time e.g. breeding seabirds, and took the opportunity to note the current state of play with Stonechats. However, a good idea of the location of Stonechat pairs within these sites was well known from previous years. Although a general improvement in territorial occupation since 2014 was noted, there were some losses too. Three areas (Finnarts Point, Dove Cove and Bennane Lea) showed a negative trend with possible reasons being due habitat change or shortage of suitable habitat. The presence of two territories at Finnarts Point frequently alters, and the possibility of one pair moving into an adjacent area away from the coast is the most likely explanation for the disappearance of one pair. 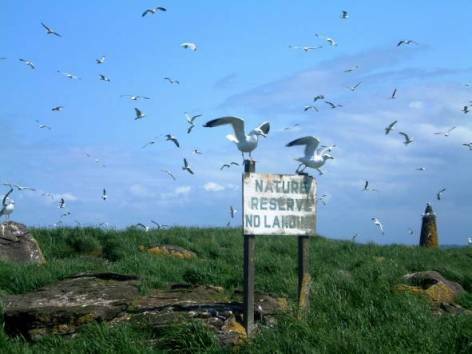 The territory at Dove Cove is marginal, with limited availability of nesting sites. Bennane Lea is harder to explain but, once again, movement into a nearby area, which was not covered, is a distinct possibility. The other area to record a drop in its recorded territories was Bogside/Ardeer, but this is such a large and difficult area to cover that the recorded results could be unduly pessimistic. There was a slow and steady recovery in many places e.g. Dipple to Doonfoot, where the first indications of re-occupation came during late autumn as males took up territories and held on to them through the winter. Perhaps the most spectacular return came in the Pow Burn and Troon South Beach stretches where the abundance of gorse scrub and rough coastal grassland has been maintained. The fact that these areas, along with the Barassie to Irvine stretch, show a very positive trend is largely due to the excellent coverage provided by just one observer who has kept a very careful eye on the territories there. As mentioned above, there was no requirement in the survey to note broods or brood sizes, although this was done in a few cases, but observers were asked to try to ensure territorial occupation/maintenance by Stonechats. Proof of this could range from a pair’s observed presence throughout the year to singing males regularly seen in the same area during the breeding season. Additional evidence might involve a bird watched carrying food to a likely nesting area or the vigorous defence of a possible nest site. 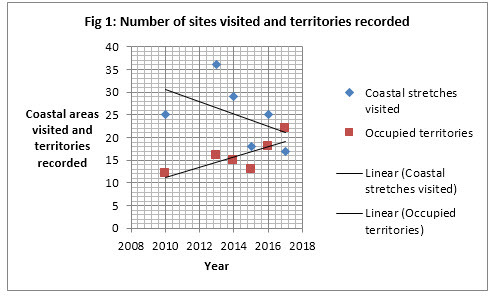 During 2013 no fewer than 36 coastal areas were visited and the results provided both a good comparison with 2010 figures – a baseline against which future results could be measured. Comparing like with like is always difficult over such a large geographical area and one or two changes occurred in the years following 2013. Firstly, one or two sites were dropped or amalgamated e.g. Downan Hill and Lendalfoot, and Fig 1 below shows the change in the overall number of sites visited. Since 2013 the number of sites checked has fallen to a more manageable 17 – 2015 was unusual due to observer effort being poorer, but this picked up again in 2016. Secondly, it’s noticeable that the number of territorial pairs has risen (allowing for the aforementioned “blip” in 2015), returning to a much healthier position than that which existed in 2013. Very little habitat change occurred within any of the sites visited, apart from some minor scrub removal, but there would appear to be one or two points worth noting when it comes to the continued well-being of the species within Ayrshire. 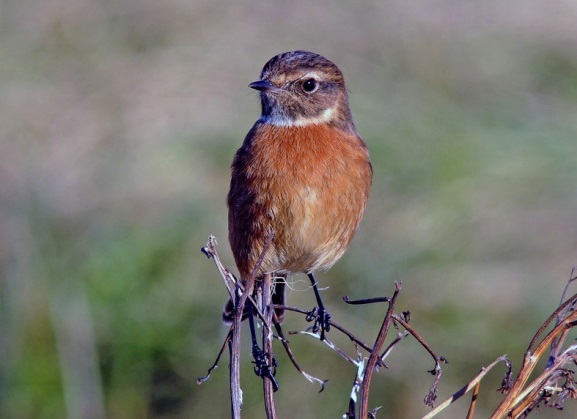 Certain areas within Ayrshire are of particular importance in supporting breeding Stonechats, including Pow Burn, Troon GC/South Beach, the Barassie-Gailes dune system and the Bogside/Ardeer peninsula. How fast has the recovery been? The 2013 survey revealed that Stonechats breeding along the coast with Ayrshire had made only the slowest of recoveries in a few areas, and were still missing from many of their former haunts. Many, if not most, of the birds which breed in upland areas well away from the coast, appear to move out in winter as the food supply diminishes, and there are relatively few records of inland birds from November to March. On the other hand, coastal territories are maintained, often by pairs, throughout the winter period. This strategy works well providing winters are mild and the food supply holds up. A prolonged period of severe winter weather will deplete the coastal numbers, but 2 consecutive winters, during which lying snow is glazed over by thawing and re-freezing, can prove lethal to a wide range of wintering birds. However, Stonechats, like many small passerines, have a high replacement rate, frequently raising 2 broods, so it’s maybe not too surprising to expect a breeding population to bounce back fairly quickly after a setback. Just how fast that recovery has been can be assessed from Fig 1. 2014 proved disappointing inasmuch as there was little sign of the species reclaiming ground, apart from the stretch between Troon South Beach and Ardeer. Territorial Stonechats were under-recorded in 2015, but both 2016 and 2017 show a steady recovery. 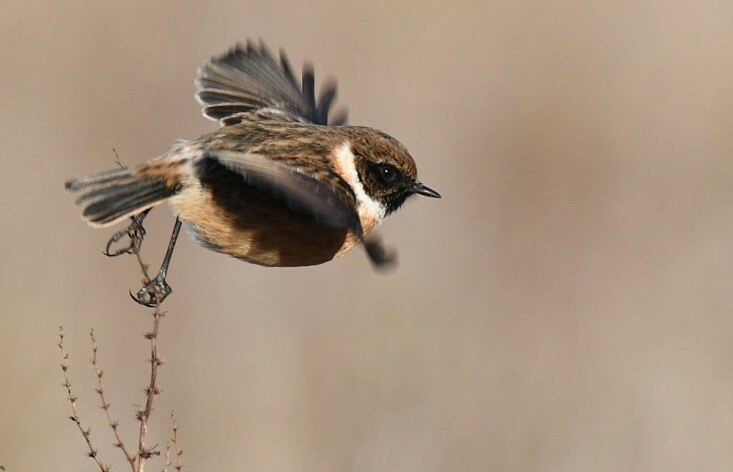 In essence, it has taken between 5 and 6 years for coastal Stonechats to climb back to their pre-2010 level, with the first 3 or 4 years showing very limited or no recovery. For a bird which decides to over-winter on its coastal breeding territory, the risks are clear, but this hardy little passerine has demonstrated the ability to make a relatively speedy return after a serious setback. None of these results would have been possible without the help of many local observers – I am extremely grateful for all your hard work in obtaining the data. A full list of observers appears at the end, but I would like to offer special thanks to Jean Anthony who continued to keep careful records for the stretches between Pow Burn and Irvine – a major effort, and one for which I’m very grateful. Others who contributed to the survey work include the following:- F Alison, J&B Anthony, G Brogan, A Brown, T Byars, E Forrester, A&A Gilchrist, R Hissett, N J Lawrie, B Lennox, E Leyden, H Martin, G McAdam, P McEwan, G Macdonald, J&S Montgomerie, D Rackham, G S Riddle, J Rogers, T&G Scott, the late A Simpson, C Smith, J Thomson, R Turner, R G Vernon and the late D Watt. I apologise for anyone unintentionally omitted from this list. This entry was posted in Articles on 04-Feb-2018 . The Green Woodpecker (P. viridis) was first recorded in Ayrshire in 1925 when one was heard calling from the Blairquhan estate woodlands. Unfortunately, the bird was not seen, but the person who heard it was, apparently, well aware of the species’ rarity in Scotland at the time. Indeed, the bird scarcely gets a mention in South-west Scotland before this, and national records remained at a low level until the end of the 1940s. The second Ayrshire record came in 1961 when a pair took up residence in “Central Ayrshire” and remained in the area for a few years, when another bird was seen at Alton Albany, Barr, in 1962. Breeding was not proved, although several nest-holes were found. For a bird which can be fairly vocal in the early part of the Spring when it is setting up its breeding territory, it can also prove quite tricky to obtain clear proof of breeding since it often becomes very elusive during the nesting period. 1974 saw the next Ayrshire record when one was present in the Portencross-Hunterston area between March and August. Three more records followed in 1977, when an adult was watched carrying food in Knockdolian Wood, this representing the first “probable” breeding record. A pair was present throughout the year “near Kilwinning” (possibly Montgreenan), and a single was observed at Sundrum in late May. From here on, for a few years, the pace of colonisation picked up. It seems likely that a pair bred at Portencross during 1978, where a juvenile was seen on the 20th August. A pair remained at Knockdolian, and other pairs were noted at Kilkerran, Kelburn and Blair, all locations with large stands of suitable, mature woodland. Two Spring records of single birds were also recorded from the lower Girvan valley. An even bigger number of records came in during 1979, with the bird stated to have bred at 3 or 4 locations (Portencross-Hunterston, Fairlie and Knockdolian). It was also seen on single dates at 4 other locations – during this period the species was steadily expanding its range Northwards in Scotland. In 1980 a pair reared 3 young at Hunterston, with other pairs noted at Portencross, Auchinleck estate and Knockdolian, and single records at 4 other sites. 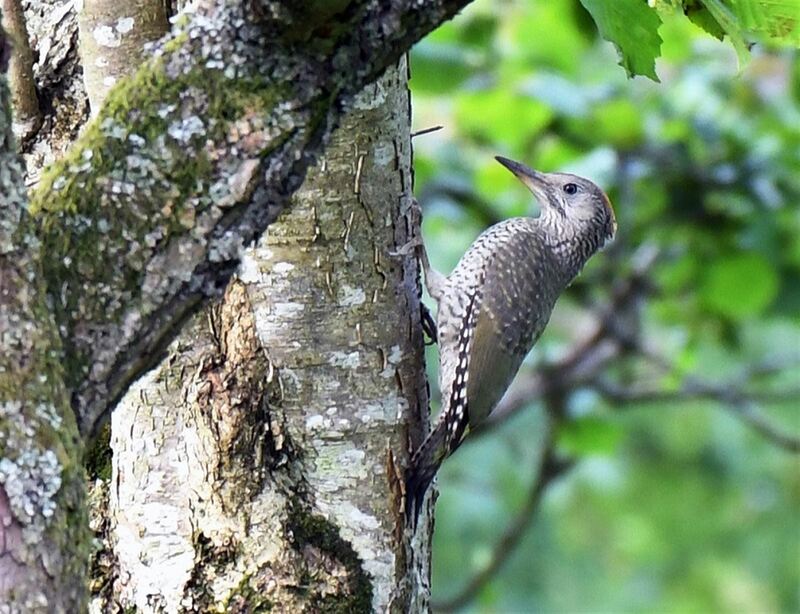 Pairs or calling birds were reported from the now customary areas of Hunterston, Portencross, Blair and Kelburn in 1981, as well as in Dailly and Dusk Glen. Only one record came from a “new” location, Glen App, during September. 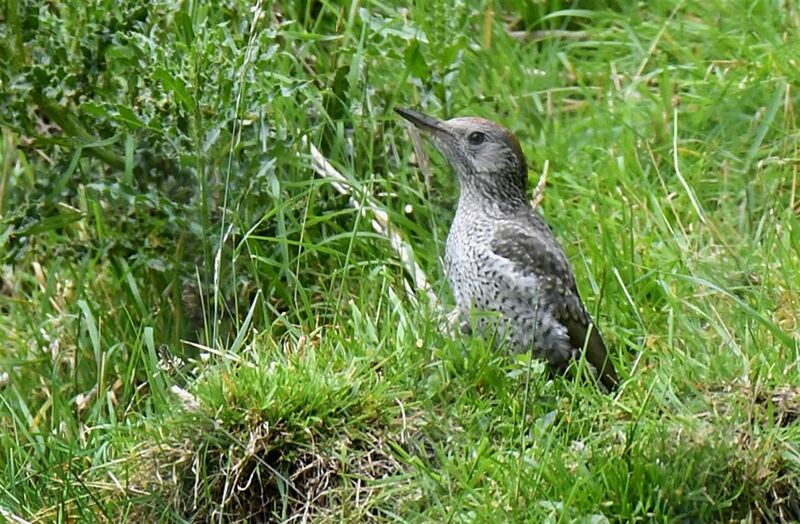 A marked reduction in records came in 1982, following a harsh winter – something which Green Woodpeckers don’t appear to handle too well – with only 3 reports of individuals at Largs, Kelburn and Currarie Glen. Although 1983 and 1984 provided a wide scatter of records, the latter year including 2 birds at Fullarton Woods, Troon, during the first quarter, no breeding records were received. This decline was noted elsewhere in Scotland, with many Northern areas being forsaken and notable decreases witnessed in Southern regions such as Dumfries and Galloway. In Ayrshire, 1985 saw a brief improvement, with a pair reported as probably breeding in North Ayrshire and other singles in suitable sites at Auchinleck estate, Barskimming, Kelburn and Hunterston. Interestingly, a single still hung on at South Wood, Troon in the early part of the year. Although 1986 saw a calling bird at its usual haunt in Kelburn during May, there were only 3 other reports of singles. Two more records of singles followed in 1987 and another two in 1988 when they were reported to have bred at Montgreenan. 1989 produced a further brace of records, with one of them at Tarfessock in April, providing a clue to the route which some of these birds follow to move into Ayrshire. The 1990s began with two further records of singles, but no breeding reported. However, 1991 showed a slight improvement, with two calling birds in suitable habitat in North Ayrshire during May. 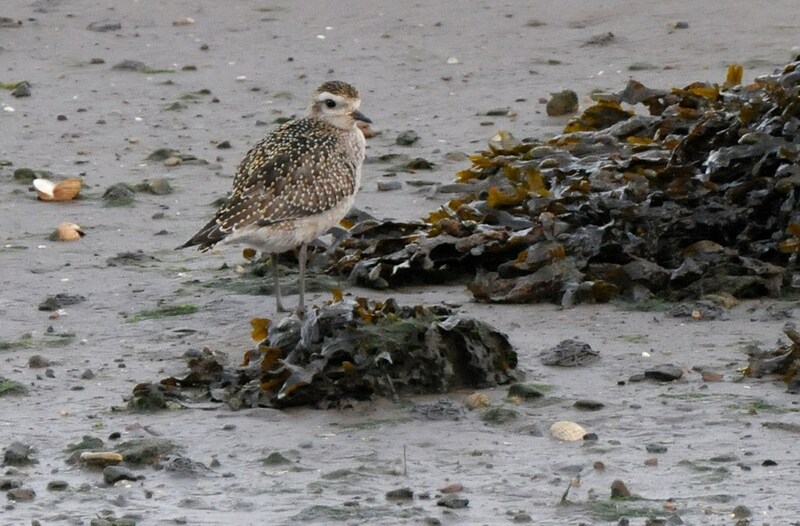 It was said to have bred at a North Ayrshire location in 1992, and this was followed by an intriguing record during August when a sickly juvenile was collected by a golfer at Troon and taken to Hessilhead Wildlife Centre. Had it been reared locally? The woodland nearby at South Wood is certainly suitable, and Green Woodpecker has a surprising ability to avoid detection. A continued improvement was evident in 1993 when up to 4 territories were noted, 2 pairs reported to have bred, in North and Central Ayrshire. Four other records of singles occurred during the year. Just when it seemed like a pattern of territory re-occupation was beginning to happen, 1994 produced only 3 records of singles. 1995 was little different with a pair at Brownmuir, and a single at Cuffhill on two dates. 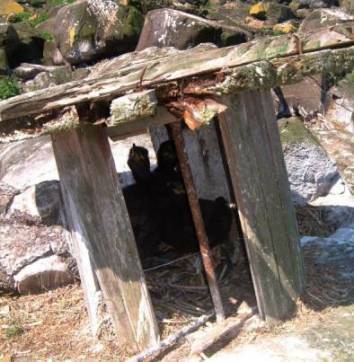 A pair was back at an old haunt, Portencross, throughout 1996, but only 3 other birds were reported from 2 locations. The Portencross pair were again present on 9th July 1997, and two other records of singles that year included a bird at South Wood. Just one midsummer record of a single bird at Kelburn in 1998 summed up the unpredictability of this species, while South Wood returned the only record for 1999 during March. This bird was present again during midsummer in 2000 – the sole report for that year. 2001 saw single birds back at Fullarton Woods in January, with others at Kilkerran and Irvine during May. April 2002 produced records of singles at Fullarton Woods and Portencross, but no more breeding records. Three further reports of lone individuals came in 2003 from Largs, Hunterston and Auchendrane, but 2004 was the first year in recent times when none were observed within the county. It looked like we were about to lose the species from Ayrshire, with only single Spring records from 2005 and 2006. Three records of Spring singles in 2007 was followed by 2 from North Ayrshire in 2008 and 2 more in 2009. Three reports of individuals in 2010 involved 2 from formerly occupied areas, 2011 produced only 2 records of singles, and 2012 saw the addition of just 3 more solitary birds. No birds were reported once more in 2013, only one in 2014, and none in 2015. Apparently the potential colonisation of the 1970s and 1980s had stalled, and the bird’s range was shrinking Southwards. On 15th April 2016 a single bird was heard calling from the oak woodland at Craigencallie, Straiton. No sooner had it flown across the river and landed on a tree when it was chased off and caught by a female Sparrowhawk – a somewhat unfortunate re-emergence of the species within the county. There were only two further reports of single birds during that year. However, a check of the same woodland in early Spring 2017 revealed the presence of a pair. Repeated visits to the site revealed their continued presence there through May, June and July, by which time they had become considerably less vocal and often difficult to see. A likely nest-hole was discovered in mid-June and a visit on 31 July produced clear evidence that they had been successful, with 3 fledged juveniles noisily flying around. This is the first proven breeding record for 24 years, although it’s quite possible that breeding has gone undetected elsewhere in Ayrshire during this time. However, in 2017, there were also 3 more records of single birds, raising the possibility that the species may be embarking on another push Northwards. This can be both a flamboyant and a frustrating species to watch, depending on the time of year but, for anyone visiting an area of suitable woodland in Ayrshire in the Spring, it would be worth listening for that “yaffle” call. Clyde Area Bird Report 1973-1976 . Forrester, R.W. & Gibson, I.P. (Eds). Clyde-Muirshiel Regional Park & Renfrew District Council. Diaries Hughes-Onslow, Sir G., Unpublished. This entry was posted in Articles on 26-Dec-2017 . Let’s hear it for Pipits!! “Well, nobody looks at pipits! !” An often repeated statement from birders and non-birders alike. It’s perhaps understandable, since this little group of birds is maybe not the most glamorous. Well, maybe I can persuade you to have a look at some of these “little brown jobs” since there’s a lot more to them than meets the eye (at least, in the first instance!). Ayrshire currently has 5 species of pipit on its list, with the large Richard’s Pipit having been recorded on only a single occasion so far. 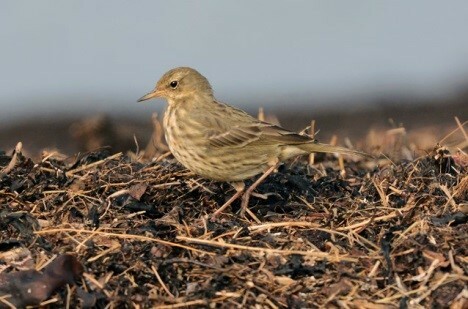 Of the four other species, Water Pipit is undoubtedly the scarcest, being a winter visitor from the European mainland. 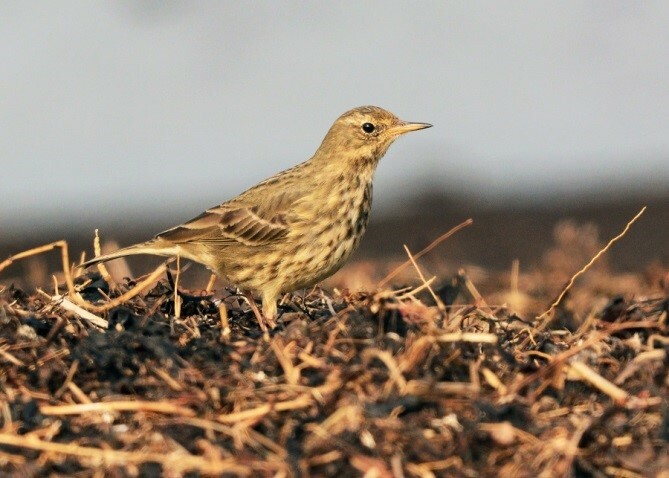 Rock Pipit is the nearest to an omni-present species, with some migration taking place during Spring and Autumn, when some other races may be involved. 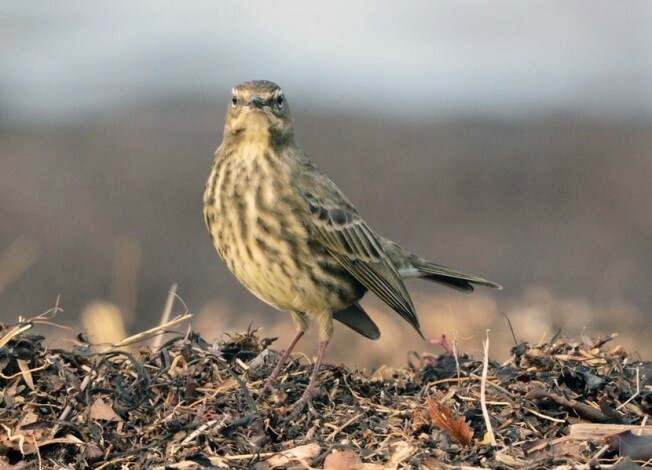 Tree Pipit is a Summer visitor and is usually present as a breeding bird in our upland forestry areas between mid April and September. The one that most of us will be acquainted with is Meadow Pipit although it, too, is a migrant, with only a few choosing to overwinter. So, let’s take two of these closely allied species to begin with and see how we can identify them. 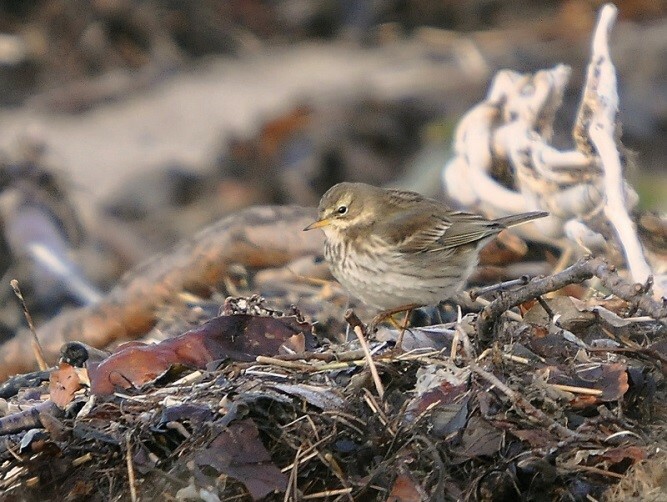 Water Pipit and Rock Pipit used to be considered as the same species, but a recent “split” resulted in a separation – and one which seemed sensible to those of us who had suggested some time previously that their habitat choices, for one thing, were substantially different. 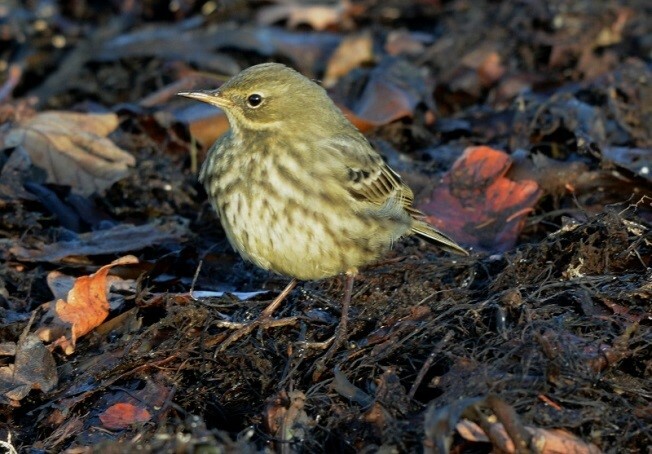 If we take Water Pipit to begin with, it’s important to know when to look for it in Ayrshire. Since the first record in 1970, the bird has been well recorded within the county, and Ayrshire has proved to be one of the best counties in Scotland in which to see one. It’s primarily a Winter visitor from its high montane breeding grounds in West and Central Europe and, while many will head South into areas like South Spain and the Balearics to overwinter, some head North-west to spend the Winter months in the UK. It was initially thought to be a bird which could be found in habitats like watercress beds and sewage farms in the Southern counties of England, with any suggestion of shoreline feeding on seaweed accumulations being dismissed. This habitat has, however, turned out to be one which is frequently used by Water Pipits in our part of the world (Scotland is not blessed with a lot of Watercress beds!). Very often these seaweed piles lie in sheltered bays or at the mouths of burns and rivers e.g. at Maidens and Doonfoot. Most of our birds arrive from the end of October and depart for their breeding grounds in late March-early April. During March they will undergo a body moult in which their appearance as a “different” species will become much more apparent. When they arrive in the late Autumn, you might be forgiven for thinking that the bird in front of you is just a bright-looking Rock Pipit. However, your attention might just be drawn initially to its unusual , flighty behaviour – quite different from most Rock Pipits, which normally allow fairly close approach. 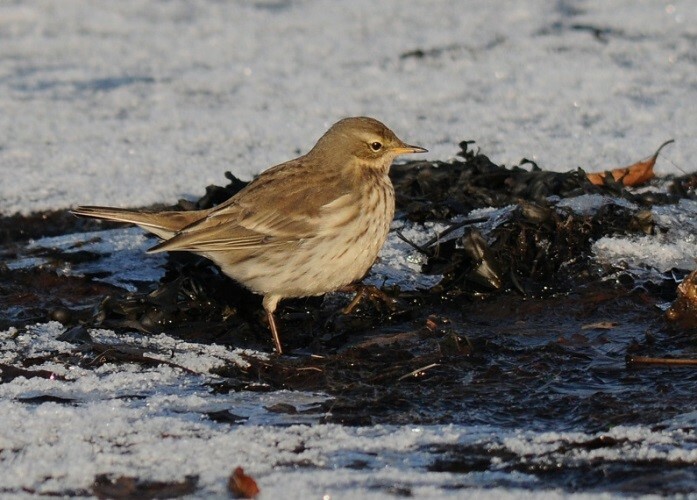 Secondly, once you’ve caught up with it, you’ll be aware of a bird which is largely white below and brown above; a contrast to most of the nearby Rock Pipits which are pretty drab with their olive-tinged grey/brown upper-parts and dull underparts, often with heavy, dark streaking in this area. A closer look at the bird will pick out one or two other notable plumage features:- a clear white supercilium, two white wing-bars on the tips of median and greater wing coverts, a white or off-white throat, and white outer tail feathers, the latter feature showing well as the bird flies away from you again! The dark streaking on the breast can appear much finer than that of Rock Pipit, and is largely concentrated on the upper breast, thinning out on to the belly and becoming much more diffuse on the flanks. A brownish/grey back will show some dark streaking, but the rump is often a richer, warmer brown colour. The bill, which is usually more slender than that of a Rock Pipit, has a largely yellow base to the lower mandible and the legs are dark, often showing reddish brown (a useful feature if you’re unsure about a greyish Meadow Pipit perhaps?). With a lot of these features, it’s well worth remembering that light conditions will play a big part in what you perceive to be colours and tones. 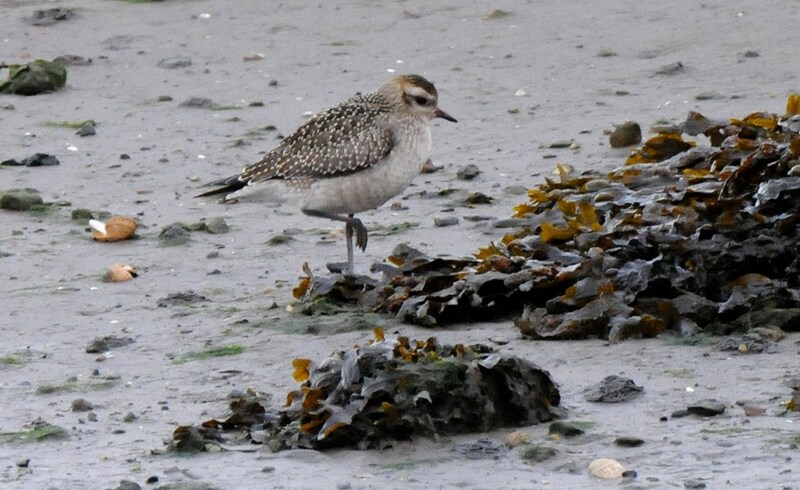 Most birds are fairly active feeders, and a good time to look for them is at high tide, when the seaweed will often be disturbed by waves lapping against it, perhaps unsettling invertebrate life within it. Above all else though, patience is the key, since most birds which take off and appear to fly for miles along the beach in front of you, will often return to exactly the same spot they were feeding in a few minutes beforehand. By mid March, if your overwintering bird is still around, you’ll start to see a few changes in its plumage. It starts to look quite scruffy and gradually takes on a pale greyish appearance. The white supercilium is still there, but now it’s set against a pale grey crown and ear coverts. The upper-parts become mostly pale grey and the dark breast streaking almost totally disappears, leaving plain white underparts with a pinkish breast. The top part of the head pattern can vaguely resemble a Northern Wheatear at times. It should be pointed out, however, that many birds will depart before they look like what most field guides show as typical breeding plumage. 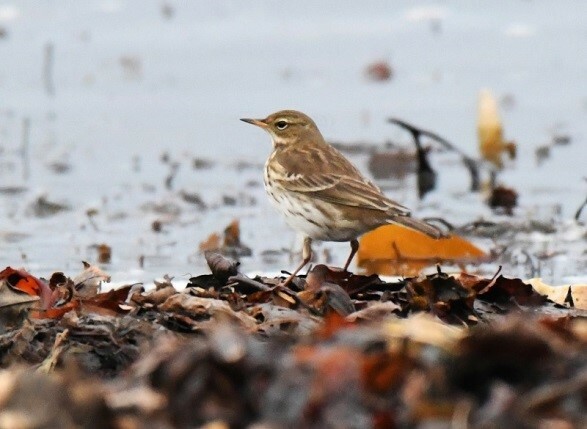 Other races of Water Pipit have been recorded within the UK, and it’s possible that the closely allied Buff-bellied Pipit could be a future addition to the Ayrshire list. That would require more folk to look harder at pipits though… so, how about it? Both birds show many differences in plumage, and it’s hard to believe that it’s the same species you’re looking at! However, the two photos illustrate just how confusing it can be to identify what many people would regard as a “dull” bird (and not worth a second look?). So, how have we arrived at the point where we’re almost considering taking up stamp collecting? Well, the two birds look similar in size and structure: they share the same habitat: and they give the same call (OK, I know that’s cheating since you can’t hear a still photograph). The next step is to look at the plumages. The November bird looks really crisp, with a lovely olive-green cast to its upperparts, and fresh upper wing coverts with their dark centres and whitish tips. Sometime during the early autumn it would have undergone a post-breeding moult and is in excellent condition. The July bird, by contrast, looks like it’s been dragged through a hedge backwards! Its worn, grey plumage shows little or none of the neatness of the November bird. The upperparts appear very plain and lack the greenish tinge of the other bird, while the upper wing coverts have all but vanished as a feature. Even the dark streaking on the breast looks worn and almost mottled in appearance. Well, it has just come to the end of the breeding season, and the plumage has obviously just lasted long enough. Time to moult! the head colour shows little contrast with the rest of the upper-parts, and, when fresh, it lacks the Water Pipit’s well defined supercilium. Instead, an obvious pale eye-ring can be seen. dark brown legs and a slightly more robust bill than Water Pipit. This bill can vary from all black, to black with a dull pinkish colour on much of the lower mandible. See if you can guess the month in which the two photos were taken (click on the photos to expand to full size). Answers at the end of the article. 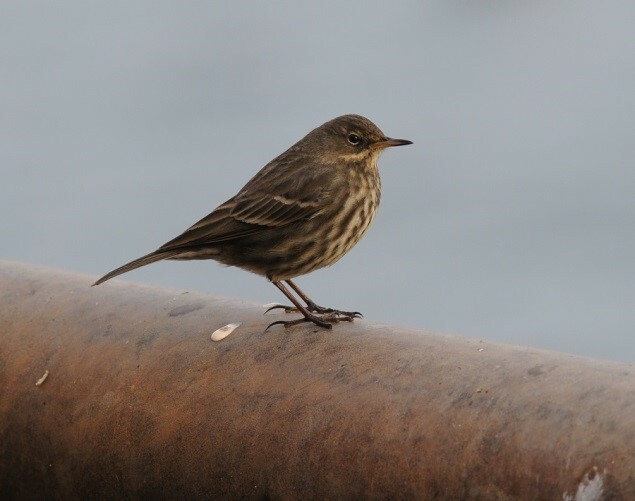 Much has been said and written in recent years about “Scandinavian” Rock Pipits, and I suppose that some of our migrant birds fit with the descriptions given in various field guides for these birds. However, even specialised books dealing with pipits and wagtails fail to agree on basic identification features, moult timings and extent etc. 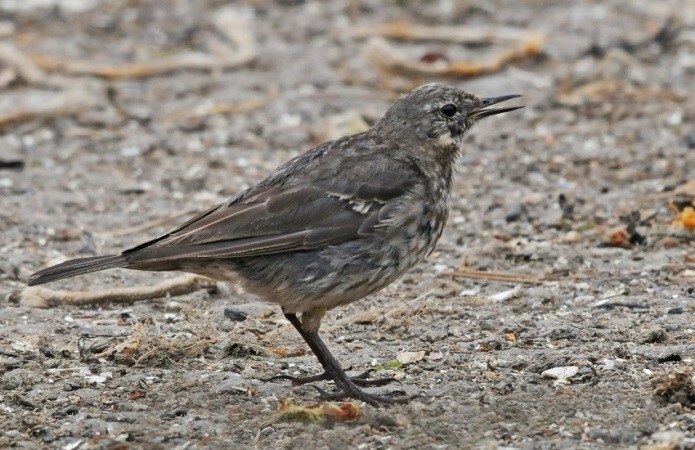 Within the UK, there used to be at least 3 breeding races of Rock Pipit, all of which vary in plumage tones according to most sources. 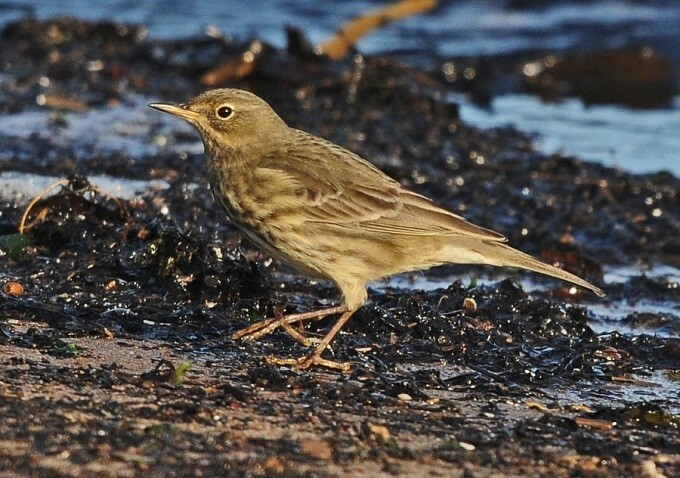 The so-called Scandinavian Rock Pipit is said to winter in the UK, but is also stated to be largely inseparable from our Rock Pipits at that period. Confused?? You’re not alone! 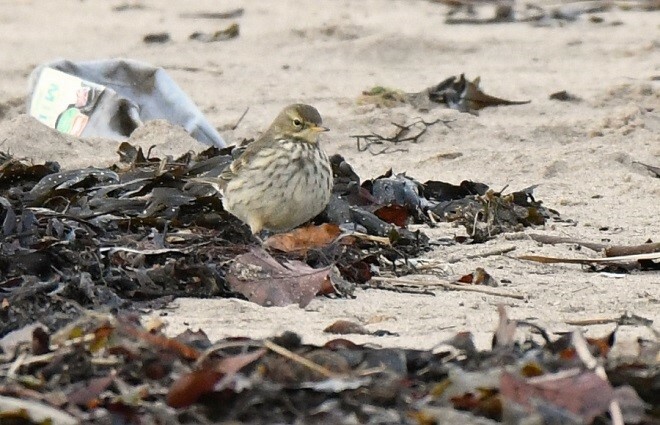 Most Scandinavian Rock Pipits are said not to assume much, or any, pinkish-ness on the breast in fresh, pre-breeding, Spring plumage – yet a few have been seen in Ayrshire which were quite obviously pink on an almost clear whitish breast. 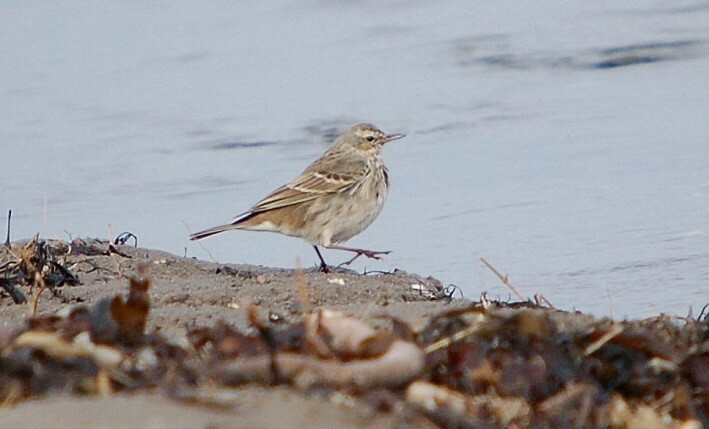 It was this feature, along with the clear white or whitish supecilium which caused some confusion among local birders in Ayrshire during the “discovery” years of the early 1970s when the first Water Pipits were being identified in the county. 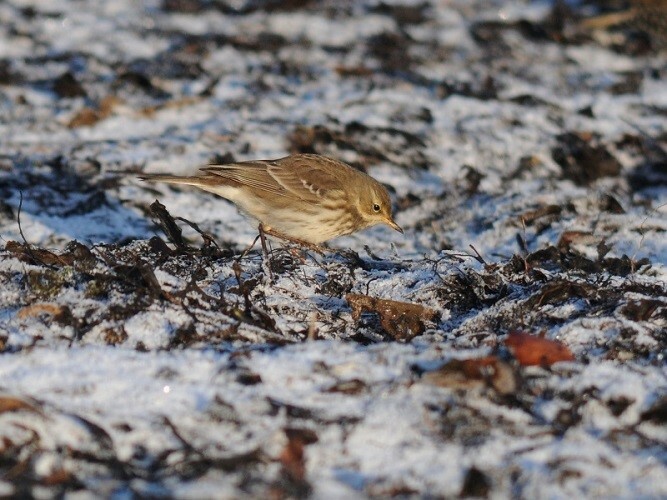 But, are these recent “odd-looking” birds Scandinavian Rock Pipits? To be honest, I’m not totally sure, and some may not be anything more than examples of what were formerly thought to be individual races (kleinschmidti from the Faroes, and Northern Isles, and meinertzhageni from the Outer Hebrides). Let me throw another idea into the ring here. 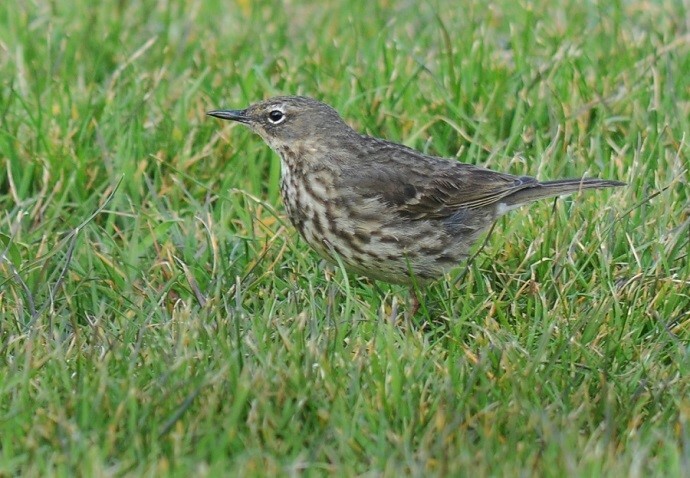 What if Rock Pipits exhibit the same variation in plumage as Meadow Pipits? That’s nothing more than mere speculation, but I remain intrigued by these strangers which appear regularly along our shorelines in Spring. No doubt, like so many other recent discoveries, work on DNA sequencing may hold the key to their true identities. 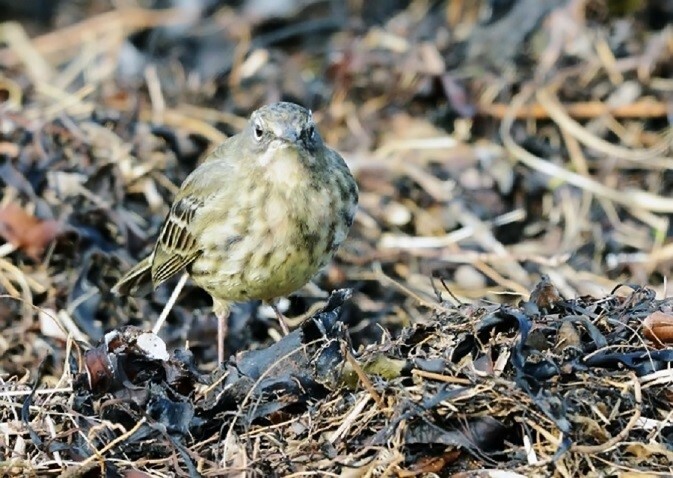 One thing is certain – Rock Pipits are most certainly not dull! Answer to earlier bird photo question: the bird on the left was one of a breeding pair at Turnberry lighthouse on 24th April. The right hand bird was photographed at Maidens on 12 November. This entry was posted in Articles on 09-Apr-2017 . Some years ago – well, a considerable numbers of years ago – I decided to take part in a county-wide survey of Rooks which had been organised by the late Malcolm Castle. This wasn’t the first such survey which he’d organised, and it wasn’t going to be his last, but it seemed so delightfully simple that I chose one or two rookeries which I would then go out and try to count. It certainly sounded simple and, typical of its organiser, the instructions were really straightforward. But, then, that’s the way surveys always look until you start on them! One major obstacle with my first large rookery at Kirkmichael was that many of the birds nested in the crowns of Scots Pine trees, rendering a totally accurate count almost impossible. However, a challenge like this was something to be tackled head-on, and, 4 hours later, I’d ploughed through just over 400 nests. One or two rookeries later, and I was starting to enjoy it, but it wasn’t until Malcolm had pulled all the results together that I saw the real purpose in doing such a series of counts. That was 1975, and Rooks were doing well within Ayrshire. The survey was repeated in 1986, and it looked like the future was bright for the species. Moreover, the survey had provided all sorts of information for observers to get their teeth into e.g. rookery sizes, favoured nest-trees and overall distribution within Ayrshire. A further survey was arranged for 1996. Sadly, Malcolm didn’t live to see the final results written up, but Roger Hissett placed the results in the Ayrshire Bird report of 1997. 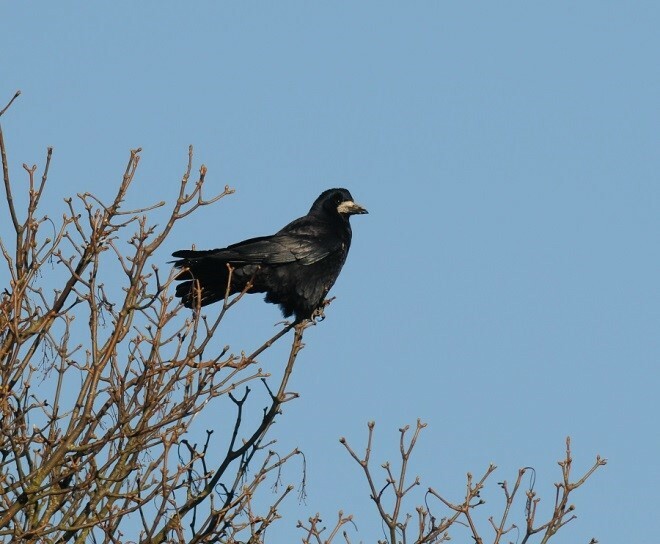 These showed that the Rook was still faring reasonably well, despite substantial changes in the rural landscape. In 2005 Kevin Waite took another slant on assessing the health of the Rook population in Ayrshire. His one-man survey drew on previous survey results, and looked at particular aspects such as urban growth, nest-tree species and site faithfulness. One urban area which seemed to have remained fairly stable was Maybole, perhaps due to the slow rate of urban expansion, and a mixed farming regime in the nearby countryside which appears to have shown relatively little change in the past 20 years. Within the town itself, most of the nests have been built in Beech trees, but one or two outlying locations, which hold between 1-5 nests, can reveal the use of other tree species, the strangest perhaps being in a car park near the Town Hall where the nests in Birch trees could easily be mistaken for the Witches’ Broom infestation. The table below outlines the count results between 2001 and 2016, most counts usually having been carried out in mid-April, at a time when most nests would clearly show signs of occupation. The 2001 count was almost certainly an under-count since, at the time, I was not aware of the full extent of the area covered by all the nests. However, since 2005, there has been an increase, and a period of stability, followed by a very slight decline. It’s difficult to be certain that this decline is something to be concerned about – many Rookeries in nearby rural areas have flourished, fragmented, declined and, in some cases, disappeared during the past 15-20 years. The reasons for these fluctuations aren’t entirely clear (there’s a job here for some keen young field-worker! ), but they will almost certainly reflect the relative abundance of food locally, to some extent. 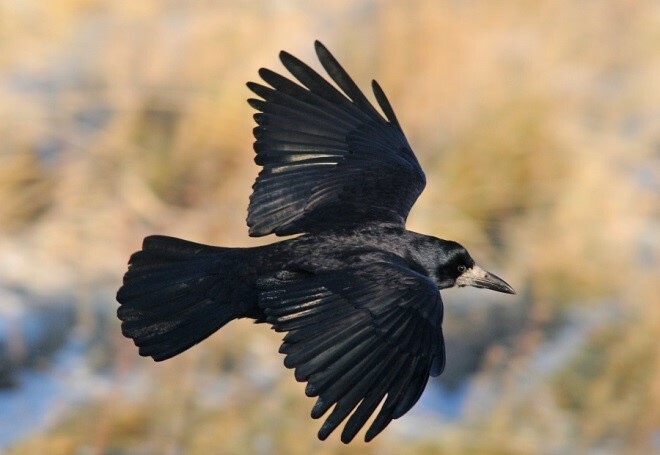 Other factors may include, for example, the increasing trend for Ravens to nest at the periphery of some Rookeries since, by nesting earlier than Rooks, they can exploit the availability of a nearby food supply. There appears to be little problem with human interference in Maybole at present, so food availability perhaps linked to a changing climate pattern could emerge as important issues. 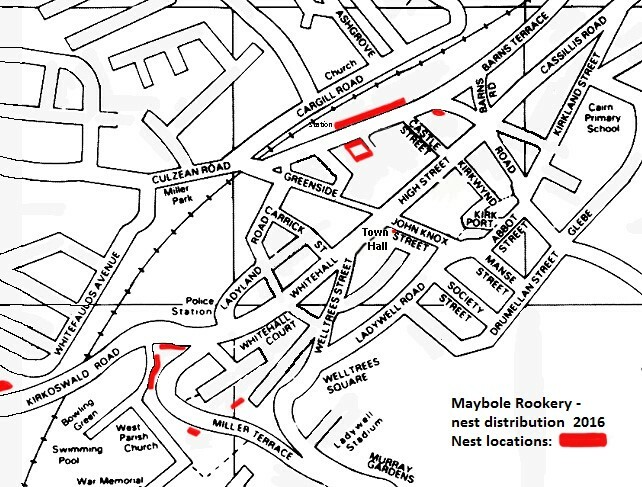 Either way, Maybole’s Rooks continue to fare reasonably well within their urban environment. This kind of survey is easily carried out, and will not just provide a picture of what’s happening to a species over a period of time, but will also throw up a range of questions associated with these results e.g What are the main factors driving the population changes? This, then, can become the basis for a related survey which can use the nesting figures as a starting point. Is anyone up for it? This entry was posted in Articles on 29-Aug-2016 . 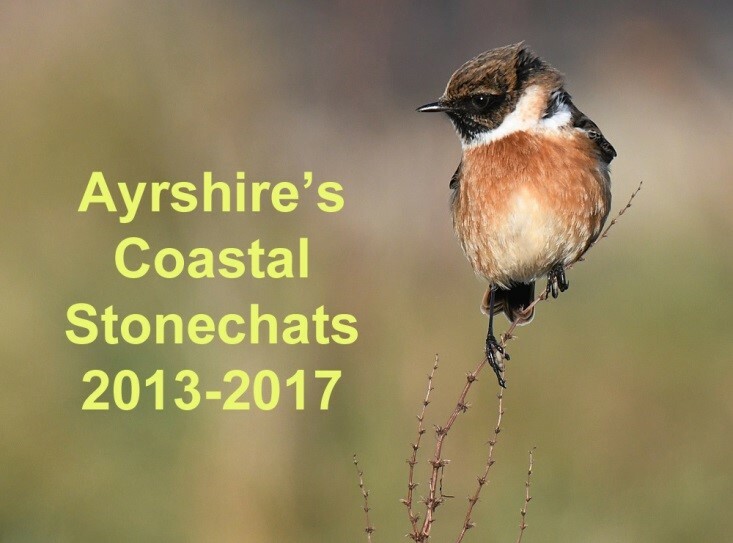 This article by Angus Hogg first appeared, appropriately enough, in the February 2014 issue of the Stonechat newsletter of the Ayrshire Branch of the SOC. This entry was posted in Articles, News on 02-Mar-2014 . The Ayrshire’s Breeding Birds Survey 1991-97 is the result of many hours field-work by many observers and probably even longer analysis by Angus Hogg. Separate maps have been produced for over 130 breeding species giving their distribution and abundance, with a commentary by Angus on the latest status. Not only is this an important historical resource, it also provides a comparison with the results to appear in the new BTO Atlas. Details on how to interpret the maps and some background information is given in the Ayrshire’s Breeding Birds Survey 1991-97 page. The maps themselves are accessible from the Ayrshire Species List (select it from the menu) and then click on the icon beside the species name. 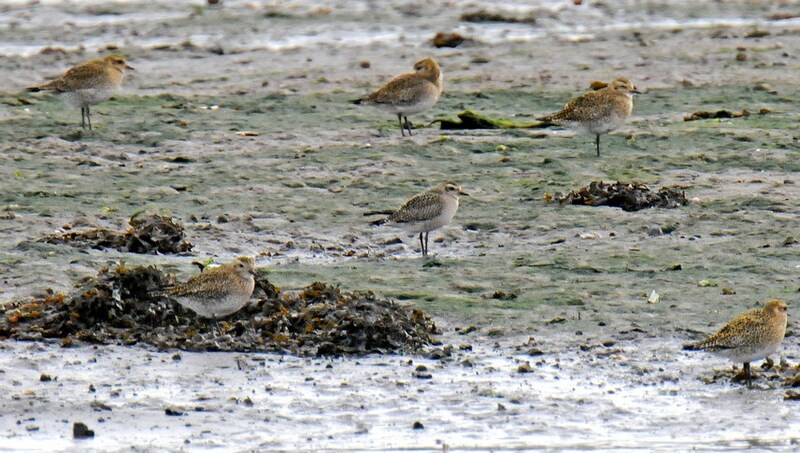 This entry was posted in Articles, Ayrshire Species List, News on 01-Sep-2013 . 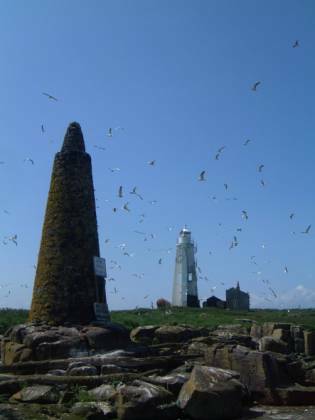 On 7 June I joined a bunch of ringers (I’m sure the collective noun is something obscene so we’ll stick with ‘bunch’) on a trip out to Lady Isle to do some ringing. 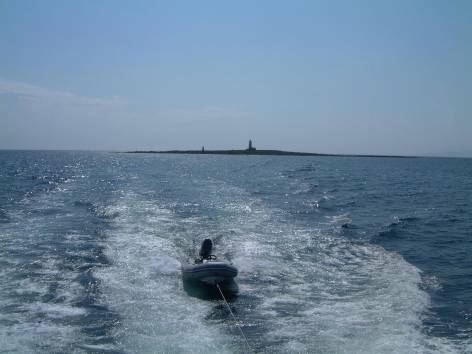 Lady Isle is a small, privately owned island 4km from Troon that is only 6m at its highest point. For many years this has been a nature reserve and you need permission to land, which made a trip to it an exciting prospect. 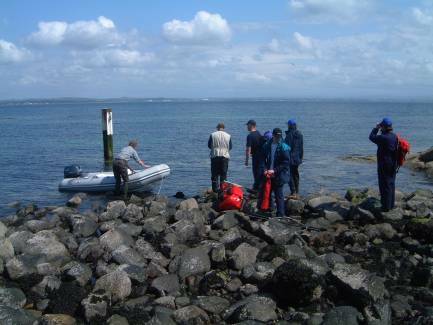 Obviously we first had to get out there and this involved taking a boat from Troon. I had expected something small, leaky and dangerous so you can imagine my delight at seeing the C-Gem. She looked like something out of Monte Carlo with a satisfying collection of high-tech safety gear and a captain who looked like he knew his port from his starboard (whereas I have concentrated on just the port). We left the harbour in a decent swell (for a fully paid-up landlubber like me). Being rough-tough outdoor types we naturally headed up to the top deck for the best view. Our captain obviously liked to give his marine diesels a thorough work-out and we were soon going at an impressive speed with the result that deluges of spray smashed over the top deck leaving me drookit. I decided that a visit to the bridge to check out our position on the GPS seemed a drier and more sensible option leaving the ringers to drown. It was an exhilarating ride: people pay good money for less at theme parks. 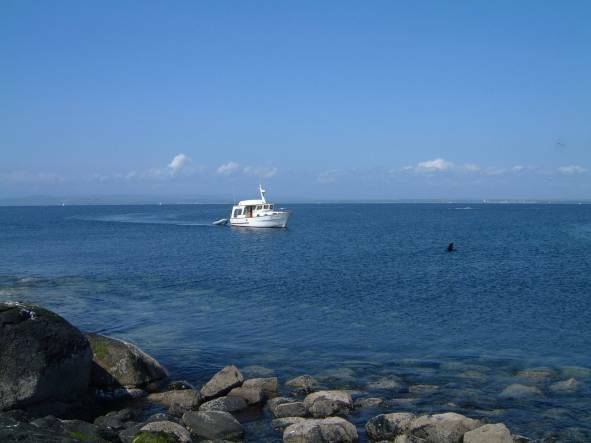 However, we soon reached the Isle and offloaded onto a fast Zodiac (piloted by Don) to reach the landing stage, passing large numbers of seals who were wondering who was disturbing the peace. As with all sea-bird colonies your senses get assaulted. Firstly there is the sight of birds everywhere: on rocks, in the air. Then comes the noise of all the gulls screaming at the intruders. Then comes the smell…. Fortunately after an hour or so your brain gives up and just ignores what your olfactory sense is telling it. From the very start I had decided to stop at the involvement of three senses; the others pushed on with at least one more. The island is uninhabited (by humans) and covered by nettles. We needed to be very careful as we headed for the bothy as nests and chicks were everywhere.It is a real circle-of-life place: eggs, chicks, young, adults, corpses, bones. The ground is very uneven and one has to be very careful in finding somewhere to put your feet that isn’t already occupied by a chick or a clutch of eggs. We left our packs (with lunches) on the one piece of open ground and headed off to start ringing. We would have to move fast as the C-Gem would return for us in roughly three hours.The island isn’t very big (say 500m at its widest) but is covered by nesting birds. The major species are gulls (Herring, Lesser Black-backed and Great Black-backed), Shag and Cormorant. Each has roughly its own area and we started with the Shags. The technique involves wandering over to a nest, grabbing the youngsters and putting on a ring. Dead easy. Unfortunately they are not too keen on this and like to protest noisily and with snaps of a pointed, sharp beak. The other safety tip is not to be in line of the front or back as they can eject “material” quite a distance. Julie discovered this to her cost: it was noticeable that people kept a bit further away from her after this (see photo 6). We could also see that the birds were being well-fed as they were keen to show us what they had for breakfast – and it was a significant repast. While the ringers were enjoying themselves with their pliers, I had the onerous task of recording the details. This required writing down the ring number and an indication of the number of birds ringed in that nest. For example, 2/3 means the nest had three chicks but only 2 were ringed (the other being too small for a ring, for example). This gives a good idea of just how well the colony is doing: this year things look very promising with most nests having broods of three chicks.The ring number is used when the bird is recovered (ringer-speak for someone finding it washed up on the tide-line): you can send the number to the address on the ring and they’ll tell you its details. Roughly 1% of ringed sea-birds are recovered in this way. However the data are invaluable as it shows how birds distribute after leaving their nests. 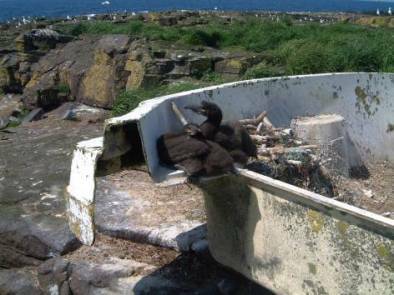 Only the Shags, Cormorants and Eiders were ringed. There were lots of gulls around but trying to distinguish the species a chick belongs to is very tricky even when you have the little blighter in your hand. You could try to spot an adult on the nest and then assume the chick is of the same species. Unfortunately this doesn’t always work as the adult might be looking for a spot of lunch rather than being all parental; also the gulls seemed to prefer being airborne shouting abuse at the humans below.Luckily it was a hot day and so the eggs wouldn’t get chilled with the parents away on screaming-duty. While we were doing all this, Chris was off trying to catch Eider. This is much more difficult as they like to hide in the long grass and nettles. The technique involves walking are fully through the nettles with a big net checking for birds. When one takes flight you lunge at it with the net and then curse as it flies off. You then repeat this procedure. Amazingly Chris managed to bag four of them this way. Once caught they get the usual ring but also a very attractive white stripe super-glued to the back of their head. This will last until the next moult (something Eiders love to do) but means that Chris can track sightings of birds along the Clyde as different sites get different coloured stripes. 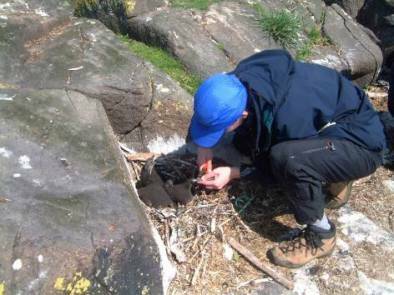 After a few hours we had run out of rings having ringed 98 Cormorants and 111 Shags in a total of 91 nests. However, this was by no means all the nests on the island. What amazed me is how much these rings cost: each Cormorant ring costs 55p. This makes ringing a very expensive hobby as the ringers all pay for their own rings. Still, it was a good excuse to have lunch with only the worry that some enterprising gull hadn’t opened up the rucksacks and made off with the sandwiches. As we munched we could see the good ship C-Gem heading out to collect us (see photo 7): as you can see she looked superb in a tropical sea (with Irvine in the distance!). Since the tide had come in a bit Captain Zodiac needed to be careful to avoid scraping the barnacles (see photo 8). We could then load our stuff. It was noticeable that people kept a distance from us now as they had that “Ahh, Bisto” moment: apparently it washes off after a few showers. Then it was a quick trip back over a beautifully calm sea to Troon Yacht Haven with a great view of Lady Isle behind us (see photo 10). It was a cracking day out. We’d all like to thank the captain of the C-Gem and Don for getting us out there in style. This entry was posted in Articles on 15-Jun-2003 .